Check out the Cyclesomatic events happening this coming week. Looks like a blast, so don’t miss out! All the information can be found at Bike Friendly OC. All the fun begins tomorrow at 8:30pm. 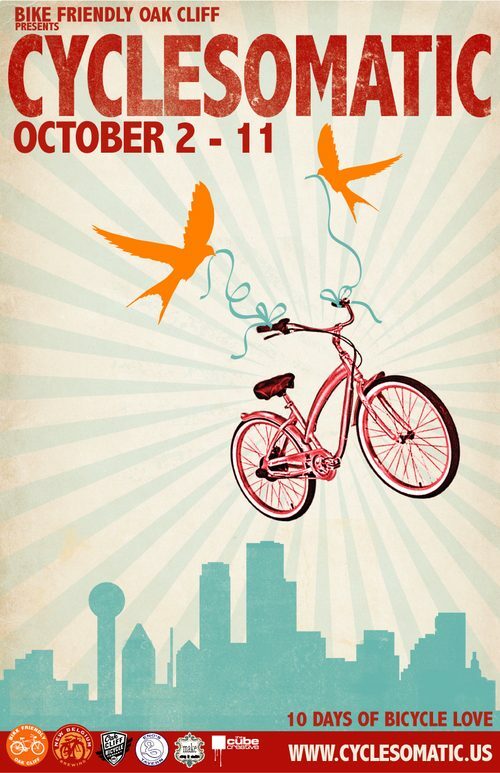 Bike Friendly Oak Cliff is proud to announce Cyclesomatic, a week long bicycle festival in North Oak Cliff from October 2nd to the 11th. Events will include a history-themed group ride, bicycle competitions, Bike to City Hall, Biketoberfest! in Bishop, an Urban Bazaar, a “Kiddical Mass” Ride, Bike to School Day, BBQ, Bands, Bicycle Films at the Texas Theatre, Art Bike Shows, and guest speaker councilwoman Angela Hunt. New Belgium brewery is sponsoring part of the week, and we’re coordinating efforts with DART, BikeDenton, the Oak Cliff Bicycle Company, the Cube Creative, Eno’s Tavern, and more.